We have been great fanboys of home projectors, especially when it comes to watching sports, playing games or viewing movies in the house. It is a great way to unwind and enjoy some quality time with family or friends. 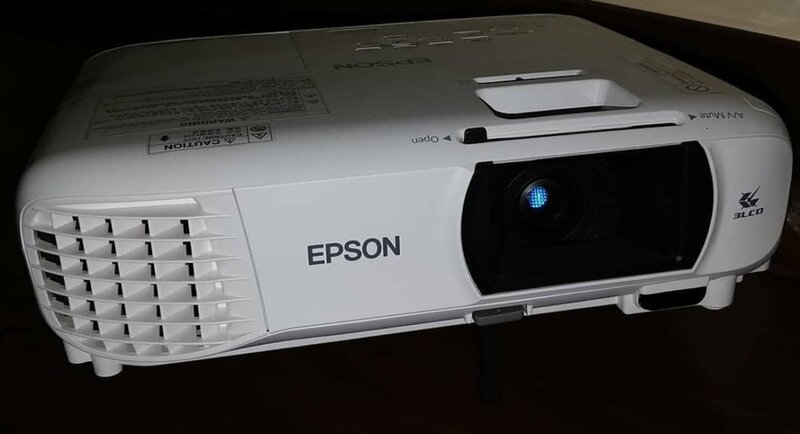 There are a lot of good projectors out there in the Indian market and joining the ranks is the latest by Epson EH-TW650. We got to play with it and this is what we could make of the projector designed for everyday use. Out of the box the Epson EH-TW650 looks like any other Epson projector with its curved body and contours. The front is dominated by the not-so-large lens, which has a shutter on top of it that can be opened or closed with the help of slider above it. This helps keeping the dust out when the projector is not in use. The top has all the keys that can be found on the supplied IR remote as well. These include, home, power, source, keystone and volume buttons. A neat kick-stick is also available for height adjustment under the lens that can be brought down by pressing the button above it. To its right is the IR receiver. Also on top, (towards the lens) Epson has placed lens focus and enlargements dials, just like the ones found on other models by Epson. This projector can throw a screen of up to 300-inches, more on that in the performance section. Couple of LED lights are also placed on top indicating, power lamp status and temperature. Turn it around and you will find all the connectivity ports. Epson EH-TW650 is a Full HD projector, so we were expecting couple of HDMI ports. Well, it has not got many but two of them. These are partnered with 1 VGA, 1 Composite, 1 USB A and 1 USB-B video ports. The rear also has the 2-watt speaker. A fan is also inside Epson EH-TW650 projector to keep the lamp and inside machinery cool. Dressed in whitest white, this projector does look modern. Epson must be proud of this machine as it has some of the best in class features one can ask from in the price range. 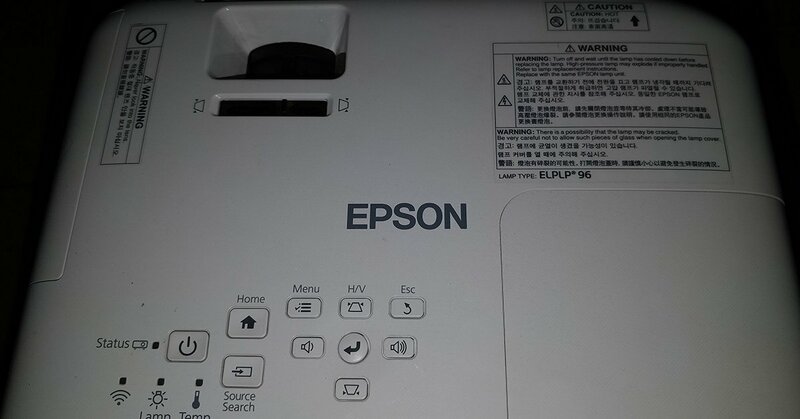 To start with, the Epson EH-TW650 hardly takes any time to setup. Just unwrap, place it and power-up. Epson also supplies a HDMI cable in-the-box so you can easily connect laptops or HD set top boxes to it. Epson EH-TW650 has a 3,100 lumens lamp (with a life of 7,500 hours) that can throw an image of up to 300-inches. We went to 200-inches and loved every bit of it. The colours are vivid with deep blacks. Best part we did not turn off the light or use a white screen to watch. We used the light yellow wall and the colours were inch perfect. We ran everything from a HD video to a Xbox game and were not disappointed. Keystone correction is available and works well on all counts. The Epson EH-TW650 also supports the Epson iProjection app that enables users to project wirelessly, after connecting the projector to Wi-Fi. Setting this up took some time, but once up we did not find any kinks. Moving to the on-board sound, this is a place where we felt the projector was under powered. The 2-watt single speaker does not do justice to the Full HD (1080p) spectacle this projector provides. 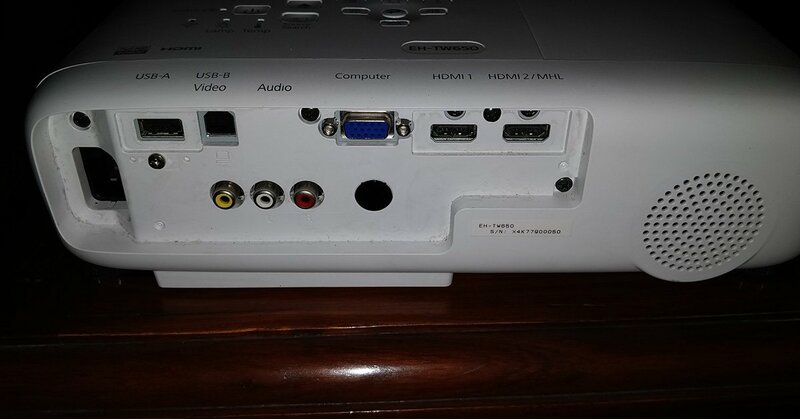 Also, since Epson EH-TW650 does not have a standalone 3.5mm audio port you will not be able to connect those speakers. One would need speakers that support composite ports. Luckily we had one and with the external surround sound the whole experience grew multiple folds. At a price of Rs 58,999 The Epson EH-TW650 falls in the budget segment of projectors. But, provides features found in mid to high segment of projectors. We loved every bit of the play, however could not get past the weak speaker. Yes, once connected to external speakers the TV, Movie and Gaming experience became much better. So like most projectors in the market the users would need to spend a little more to get good speakers, unless you have one lying at home. Hence, the Epson EH-TW650 projector does not lose much points there. All in all, a great projector to own if you are setting up your new living room and want a large screen experience.